As faithful readers of this blog know, I am a hopeless bibliophile. Fortunately my bride shares that affliction. Yesterday we went down to a library sale in Normal, Illinois. Here are my purchases with comments. For the sake of brevity I will not include the purchases of my bride. The Class Struggle in the Ancient World, G.E.M. de Sainte Croix (1981)-I have long searched for this tome. Although a Marxist interpretation of the Ancient world, I have heard good things about it from historians I respect. We shall see. Chivalry, Leon Gautier (1989)-A Nineteenth Century look at the everyday life of French knights in the Twelfth Century. The Black Death, Philip Ziegler (1993)-An illustrated version of Ziegler’s classic 1969 study of the plague that killed 25% of the population of Europe in a handful of years. Not light beach reading. 1812: Napoleon in Moscow, Paul Britten Austin (1995)-It is a melancholy reflection on human intelligence to ponder that the greatest general, perhaps, in human history decided to invade Russia in order to cause the Russians to stop trading with Great Britain. The trade embargo of course was a disastrous policy that merely caused problems in Europe, the Brits getting rich by having a monopoly on trade with the rest of the World, and carrying on an immense smuggling trade with Europe. In addition, Napoleon assumed that Russia was merely Austria writ large, and if he took Moscow, (not even the capital of Russia at that time), the Tsar would come to heel. Of course Napoleon also amassed 600,000 troops for the invasion without making sufficient logistical arrangements for them, once they could not live off the land. When geniuses make blunders, they often are beauts. 1812: The Great Retreat, Paul Britten Austin ((1996)-See above. Jacksonland, Steve Inskeep (2015)-The story of the great land grab from the Cherokees. The Southern Dream of a Carribean Empire, Robert E. May (1989)-A fascinating look at Southern based filibustering expeditions in Central America in the 1850s and the desire of some Southerners to acquire Cuba and other islands in the West Indies. If the Confederacy had achieved independence, I have no doubt that the Union and the Confederacy would have directly clashed, or waged proxy wars, in this area. Attack and Die: Civil War Military Tactics & the Southern Heritage, Grady McWhiney and Perry D. Jamieson (1982) One of the more laughable books written about the Civil War, it attributed to the South a fondness for head long attacks due to the “Celtic” heritage of the Southerners. The thesis was ridiculous for many reasons, including that both the Union and the Confederacy had similar ethnic makeups among their native white populations, and that Union commanders were just as fond of headlong attacks (Fredericksburg, Cold Harbor, Kenesaw Mountain, etc.) as Confederate commanders. Fesseden of Maine, Charles A. Jellison (1962) A biography of the Civil War era senator from Maine, who sacrificed his political career when he voted against the conviction of President Andrew Johnson. The Papers of Ulysses S. Grant, Volumes 11 and 12, June 1-November 15 1864, editor John Y. Simon (1984)-These volumes go for a hundred bucks apiece, so I was happy to get these books for a buck apiece. Grant was a master of conciseness and clarity in an age that treasured verbosity and a rotund style. His writings are a pleasure to read, beyond their historical value. This was a lifetime project of Professor John Y. Simon at Southern Illinois University. He had completed his 30th volume when his life’s work came to a screeching halt in 2008 due to sexual harassment claims by two co-workers when he was 75. Under the stress of the allegations he died, and SIU ultimately lost the Grant papers to the University of Mississippi which completed the project with the publication of the 31st and 32nd volumes. Simon’s widow, they had been married for 51 years, disputed the sexual abuse allegations. Go here to read about what may have been a modern version of a witch hunt. Centennial History of Illinois, Volume III The Civil War Era, Arthur Charles Cole (1919); Volume IV The Industrial State, Ernest Ludlow Bogart and Charles Manfred Thompson (1920); Volume V The Modern Commonwealth, Ernest Ludlow Bogart and John Mabry Mathews (1920)-Three of the five volume history commissioned by the Illinois Centennial Commission. This year is the bicentennial of Illinois. I am unaware of any history like this underway. That may be because Illinois is broke. It may also be just as well. Glancing through the three volumes they seem pretty lackluster, although the third volume, due to the intrinsic interest of the Civil War, may be worth reading. Illinois Literature: The Nineteenth Century, edited by John E. Hallwas (1986)-With such writers as Lincoln and Grant, and a host of lesser luminaries, this book will supply some interesting reading for me. McLean County in the World War, E.E.Pierson and J. L.Hasbrouck editors (1921)-One of a host of books in the wake of World War I commemorating the war effort of local communities. These volumes provide largely untapped resources for histories of American participation in the Great War. Glancing at it, I am struck by the number of servicemen who died of Spanish influenza and accidents. A section on “Our Colored Heroes” recalls the participation in the War of black men from McLean County. Extensive information on the home front helps bring to life a time a century ago in a county I am quite familiar with. A Guide to the History of Illinois, edited by John Hoffman (1991)-A great resource for those interested in the history of the Land of Lincoln. Chapters by experts on the different periods in Illinois list available articles and books with comments as to their value. The American Revisionists: The Lessons of Intervention in World War I, Warren I. Cohen (1967)-A look at five historians who, prior to World War I, championed the viewpoint that American intervention in World War I had been a mistake. The Panay Incident, Hamilton Darby Perry (1969)-World War II almost came early when Japanese bombers sunk the American gunboat Panay in China on December 13, 1937. Combined Fleet Decoded, John Prados, (1995)-Prados is a game designer and a writer. I have played his games and read his books with enjoyment over the years. Left wing in his politics, he does not allow that to impact his historical research. This book looks at American intelligence in the Pacific in World War II. Being able to read the messages of the Japanese fleet gave the Americans a huge advantage, the impact of which Prados examines in detail. Hitler’s Jewish Soldiers, Bryan Mark Rigg (2002)-I was surprised to learn that some 150,000 men of Jewish ancestry served in the Wehrmacht during World War II, almost all of them draftees. The Nazis regarded Jews as a race rather than a religion. This opened endless perplexities as to who was a Jew. Half Jews were discriminated against, but usually not rounded up for extermination if they lived in households with non-Jews. Quarter Jews usually escaped discrimination. Serving in the Wehrmacht, some half Jews attained General rank. Hitler had the power to declare that the anti-Jewish laws did not apply to a specific individual and/or “Aryanize” someone by declaring them to be a German rather than a Jew. These men often served valiantly while having relatives who were being exterminated by the Nazis. In 1940 Hitler ordered the expulsion of half Jews from the Wehrmacht, but exceptional soldiers could apply for exemption and many of them did. Of course, the safest place for many Jews in Nazi Germany could be, ironically, serving in the Wehrmacht. Jewish veterans often noted that their fellow soldiers tended to accept them, and tried to protect them. Like most features of life in the nightmare that was Nazi Germany, the treatment of partial Jews in the Wehrmacht has a bizarre quality to it. Flying Tigers, Sam Kliener, (2018)-If Hollywood ever wishes to celebrate real life American heroes they have to look no farther than the men of the American Volunteer Group who flew for China from November 1941-July 4, 1942. Always vastly outnumbered, and flying planes in many respects inferior to most of the Japanese fighters they fought, the men of the Flying Tigers shot down 229 Japanese planes, achieving a stunning ten to one kill to loss ratio. Their victories sustained American morale in the dark early days of the War. On July 4, 1942, the Flying Tigers were transformed into the 23rd Fight Group, United States Army Air Force, with their commander being Brigadier General Claire Chennault, commander of the Flying Tigers, the man whose brilliant tactical innovations and skilled leadership helped his men achieve their incredible against the odds victories. The 14th American Air Force stationed in China would later take up the proud title of Flying Tigers. Something for the weekend. Autumn from The Four Seasons by Antonio Lucio Vivaldi. The American Civil War has become such a part of American folk-lore, and so romanticized by reenactments, films, movies, etc, that we sometimes risk losing sight of just how dreadful it was. The death toll in the war would be the equivalent of us losing some six million killed in a war today and some ten million wounded, many of those maimed for life. One quarter of the nation devastated, and a huge war debt. Americans tend to be optimists and to view themselves as blessed by God. How had this dreadful calamity come upon the nation was the cry from millions of Americans at the time. Following three hours of violent artillery fire of preparation, the Infantry advanced at 5.30 a.m. on September 26th, accompanied by tanks. During the first two days of the attack, before the enemy was able to bring up his reserves, our troops made steady progress through the network of defences. Montfaucon was held tenaciously by the enemy and was not captured until noon of the second day. By the evening of the 28th a maximum advance of 11 kilometres had been achieved and we had captured Baulny, Epinonville, Septsarges, and Dannevoux. The right had made a splendid advance into the woods south of Brieullessur-Meuse, but the extreme left was meeting strong resistance in the Argonne. The attack continued without interruption, meeting six new divisions which the enemy threw into first line before September 29th. He developed a powerful machine-gun defence supported by heavy artillery fire, and made frequent counter-attacks with fresh troops, particularly on the front of the Twenty-eighth and Thirty-fifth Divisions. These divisions had taken Varennes, Cheppy, Baulny, and Charpentry, and the line was within 2 kilometres of Apremont. We were no longer engaged in a manoeuvre for the pinching out of a salient, but were necessarily committed, generally speaking, to a direct frontal attack against strong, hostile positions fully manned by a determined enemy. By nightfall of the 29th the First Army line was approximately Bois de la Cote Lemont-Nantillois-Apremont – southwest across the Argonne. Many divisions, especially those in the centre that were subjected to cross-fire of artillery, had suffered heavily. The severe fighting, the nature of the terrain over which they attacked, and the fog and darkness sorely tried even our best divisions. On the night of the 29th the Thirty-seventh and Seventy-ninth Divisions were relieved by the Thirty-second and Third Divisions, respectively, and on the following night the First Division relieved the Thirty-fifth Division. The critical problem during the first few days of the battle was the restoration of communications over “No man’s land.” There were but four roads available across this deep zone, and the violent artillery fire of the previous period of the war had virtually destroyed them. The spongy soil and the lack of material increased the difficulty. But the splendid work of our engineers and pioneers soon made possible the movement of the troops, artillery, and supplies most needed. By the afternoon of the 27th all the divisional artillery, except a few batteries of heavy guns, had effected a passage and was supporting the infantry action. The initial stage can be rated a success, but with grave deficiencies shown in American training and leadership and hence the pause for reorganization and to replace the initial attacking divisions. The Offensive would resume on October 4, 1918. On the night of September 25th, the 9 divisions to lead in the attack were deployed between the Meuse River and the western edge of the Argonne Forest. On the right was the Third Corps, Maj. Gen. Bullard commanding, with the Thirty-third, Eightieth, and Fourth Divisions in line; next came the Fifth Corps, Maj. Gen. Cameron commanding, with the Seventy-Ninth, Thirty-seventh, and Ninety-first Divisions; on the left was the First Corps, Maj. Gen. Liggett commanding, with the Thirty-fifth, Twenty-eighth, and Seventy-seventh Divisions. Each corps had 1 division in re serve and the Army held 3 divisions as a general reserve. About 2,700 guns, 189 small tanks, 142 manned by Americans, and 821 airplanes, 604 manned by Americans, were concentrated to support the attack of the infantry. We thus had a superiority in guns and aviation, and the enemy had no tanks. The axis of the attack was the line Montfaucon-Romagne-Buzancy, the purpose being to make the deepest penetration in the centre, which, with the Fourth French Army advancing west of the Argonne, would force the enemy to evacuate that forest without our having to deliver a heavy attack in that difficult region. A century ago George C. Marshall, an acting Colonel on the Operations Staff of the American Expeditionary Forces, was finishing up a military miracle, overseeing the movement of 400,000 American troops to participate in the Meuse-Argonne Offensive. Marshall had first come to the notice of General Pershing on October 3, 1917 when Pershing was severely dressing down officers of the First Division after he had viewed what he regarded as a fouled up training exercise. Major Marshall, the Operations Officer for the Division, interrupted Pershing and reminded him of the problems the First Division was laboring under. Pershing, instead of taking umbrage, listed carefully to what the young Major had to say, and on future visits to the First Division would take Marshall aside for the “straight scoop” on what was going on with the Division. Pershing had Marshall eventually transferred to the Operations Staff of the AEF and after the War made him his aide. Marshall, who would be Chief of Staff of the Army during World War II, remarked in an interview in 1957 that he never encountered an officer more willing to accept constructive criticism than Pershing. Like many an American officer who rose to fame in World War II, Marshall’s service in World War I taught him many important lessons, and not the least important was the willingness to listen to subordinates who were giving him information to help solve the myriad of military conundrums that any conflict kicks up. The “Checkers Speech” given by Richard Nixon which allowed him to stay on the ticket as Vice-President on September 23, 1952. The speech got its name from Nixon’s use of the pet dog given to his daughters, Checkers, to gain sympathy by stating that the girls had gotten fond of the dog and he would not return it. The speech was classic Nixon: go on the offensive, self-pitying, maudlin and oh so effective. 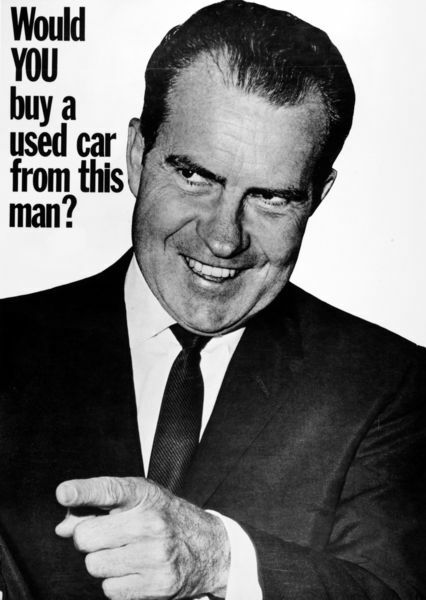 Nixon was never a great orator, but until Watergate he never lost the touch of appealing to the average American. His high brow, usually left wing, critics savaged him, but Nixon never forgot that the purpose of a political speech is persuasion. Something for the weekend. Spanish Ladies. One of the most popular of sea shanties, it was written circa 1796, by that most prolific of all authors Anonymous, an artifact of the French Revolutionary wars. It quickly became popular among American sailors. Of all the luminaries of our early Republic, none had a sharper mind than John Randolph of Roanoke. It was his misfortune, and also the misfortune of the nation, that this formidable intellect was given to someone who was also more than a little mad. From the time of his first election to Congress at 26, when the clerk of the House asked him if he was old enough to serve, he quipped, “Ask my constituents.”, his brilliance shone in his writings and speeches, as his madness grew as he aged. But for the madness, I have no doubt that he would be one of the major figures in our history. As it is, we have some immortal phrases to remember him. Last but certainly not least is his memorable observation about political opponent Edward Livingston: He is a man of splendid abilities, but utterly corrupt. He shines and stinks like rotten mackerel by moonlight.